A new range of site lighting has been created in partnership with industry professionals by lighting expert, Luceco. The comprehensive range of robust, high performing and efficient 110V site lights have been developed based on feedback from those using similar products across a wide range of environments. The new work lights further expands Luceco’s arsenal of lighting options, joining an already broad range of lighting products aimed towards the day-to-day tradesperson. One of the stand-out products within the range is the open area work light. This portable, dynamic light consists of three individual LED light bars, producing a total output of 3600 lumens. Arranged in a single column on a foldable tripod, the light bars can be easily manoeuvred on-site, allowing light to be distributed in either a 360 or 180 degree arc, offering a complete solution for many on-site tasks. Available from April 2019, the range provides a variety of site lighting options. All of the lights are certified to a minimum IP rating of IP44; however, the bulk of the fittings are tested to IP65, with the plug being IP44. The range is completed by a number of tripod work lights. It includes options for single or twin heads, a plasterer’s work light, festoon kit, a portable work light and non-corrosives in both two foot and five foot. All lights in the range come complete with 110V plugs and cable, meeting current standards. 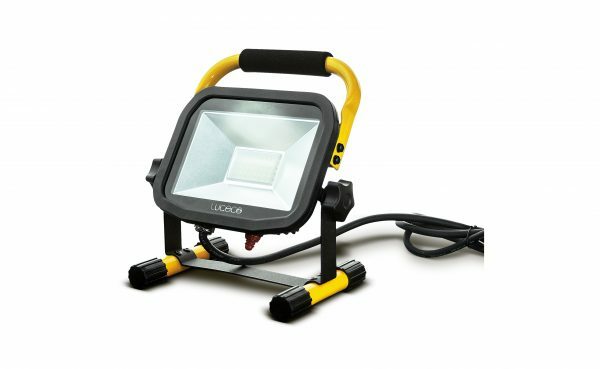 Luceco’s 110V site offering is backed up by their current rechargeable work light and inspection torch range, which offer tradespeople comprehensive task lighting solutions.